W. Scott Campbell, MBA, PhD is an Associate Professor for the Pathology and Microbiology department, Sr. Director of Research Technoloiges - UNMC and Director of Pathology and Public Health Informatics. 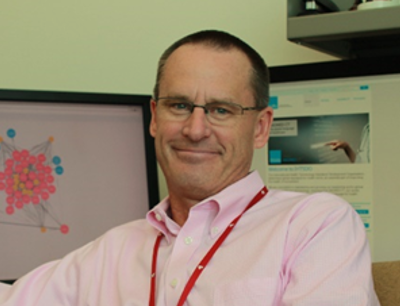 Dr. Campbell completed his doctoral training at UNMC in health informatics in 2013. Prior to his academic training, Dr. Campbell earned a Masters of Business Administration (University of Wisconsin – Madison, 1990). He began his career in the food industry and later in the automotive industry serving in a variety of capacities. In 1998, he started his own company focused on medical office computer management systems including billing systems and electronic health records. He has directly participated in the implementation of approximately 100 electronic health record software systems and practice management systems in the ambulatory care environment. Welcome to the Campbell Lab. Data standards, in particular, reference terminologies are designed to render clinical information into machine readable, computable formats. In so doing, the rich information recorded during every day clinical encounters between patient and health care providers can be analyzed using computational techniques to support clinical care, population health and analytics. The work that we are performing in our laboratory is to use data standards and terminologies to represent the words (i.e., natural language) represented in the pathology report so that the data is readily accessible to both humans and computers. Encoding data at the time of the diagnostic reporting process prepares the data for multiple uses without manual chart reviews. The information can be electronically exchanged between clinical information systems, and it can be used for population health management or research through the simple act of pairing computable terminology with common humanly readable documents. We employ SNOMED CT and LOINC for this work as both terminologies are broadly deployed and in use worldwide. Dr. Campbell is a certified SNOMED CT Implementation expert. Working in the context of SNOMED International provides a venue to collaborate with the international community interested in this work and allows a platform to extend this work to the various professional societies operating in other nations. We collaborate with investigators associated with the College of American Pathologists (CAP) within the US to coordinate and extend this work throughout the US. Internationally, we are working with the National Colleges of Pathology in the United Kingdom and Australia, as well as, Sweden. This effort began with UNMC's involvement with SNOMED International. In conjunction with data standards, our laboratory works with various database technologies to expose clinical data encoded with terminology standards to clinicians and clinical researchers to support their needs. NoSQL and SQL technologies are employed to manage tissue repositories (biobanks) and support a variety of research and clinical quality objectives.